America’s dependence on oil is one of the most serious threats that our nation has faced. And just last week I visited the Electric Vehicle Technical Center in Pomona, California, which is testing batteries to power a new generation of plug-in hybrids that will help end our dependence on foreign oil. 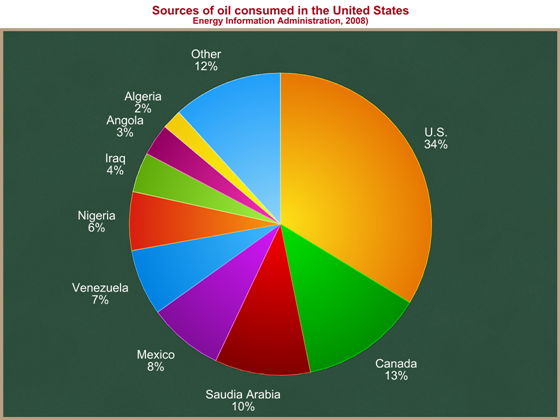 Is the U.S. dependent particularly on foreign oil, or just to oil? Is there anything we can do to break our “addiction to” or “dependence on” foreign oil? In the Bush White House, policy staff worked hard over several years to excise the phrases “dependence on foreign oil” and “addiction to foreign oil” from the President’s prepared remarks. I hope the Obama team goes through the same effort. Sloppy language on this point creates expectations that can never be met by policy. In 2008 the U.S. consumed an average of 14.7 million barrels of crude oil per day. U.S. suppliers produced just under 5 million barrels per day (bpd), meaning we imported 9.8 million bpd from the rest of the world. This is the flawed logic that supports the phrase “dependence on foreign oil.” It suggests that we can control the source of American oil. We cannot, and even if we could, it would not matter. Large portions of the global oil supply are vulnerable to shocks. These shocks, hurt all consumers of oil, no matter where they occur. A significant share of U.S. income goes to people we do not like (e.g., President Chavez’ government) to pay for the oil they supply us. They use these profits to do things we do not like. Imagine a huge reservoir, being filled by a handful of large rivers and a whole bunch of tiny streams. Several of the large rivers are controlled by governments (labeled “Saudi Arabia,” “Iraq,” “Iran,” “Nigeria,” and “Venezuela”) and are subject to being instantaneously shut off (or dramatically reduced) at any point in time. Everybody dips their cups into the reservoir to drink. If any one of those rivers shuts off or diminishes, there is suddenly less water going into the reservoir, and everybody who drinks from it is hurt (the level in the reservoir drops and the price of water spikes upward). In a global oil market, consumers of oil buy it from wherever it is least expensive. The relative sizes of the above wedges are based on the relative costs of extracting oil and shipping it to the United States. Imagine a world in which the U.S. produced 15 million bpd domestically, more than meeting our domestic needs, and that we imported no oil from other countries. Now imagine a big supply shock outside the U.S. (a terrorist attack in the Middle East, Nigeria rebels, the Iranian or Venezuelan government shuts off supply just because they can). Those nations that import from the affected country would lose their supply source. They would bid up the price of oil worldwide, including in the U.S. American consumers and firms would have to pay higher prices even though the supply shock occurred in a country from which we import no oil. We are still vulnerable to supply shocks in unfriendly or unstable nations whether or not we import directly from them. We are vulnerable to shocks in the supply of oil, wherever it occurs. [Update: see correction below], rather than to lose particular slices. We would still be sending American cash to oil suppliers from states with unfriendly leaders (like Venezuela), just less of it. Becoming more efficient in our usage of oil will help achieve this goal, but will not result in a shift away from any particular supplier nation. There is a counterargument, but it’s a stretch.” You could argue that since foreign oil is a subset of oil, if our goal is to reduce our dependence on oil, it is not inaccurate to highlight a subset of that goal. “Dependence on foreign oil” is not incorrect, a speechwriter or communicator might argue, just misleading. Update: A commenter correctly points out that you would not expect the pie to shrink proportionately, but instead for the highest marginal cost producer of oil to drop out first. I believe that is correct as a global matter. It’s harder to tell exactly how dropping the highest marginal cost producer would affect any particular country’s sources, as things would shift around. But my earlier statement about “roughly expecting the pie to shrink” was an incorrect oversimplification. The point that we could not choose which slices to drop still stands.